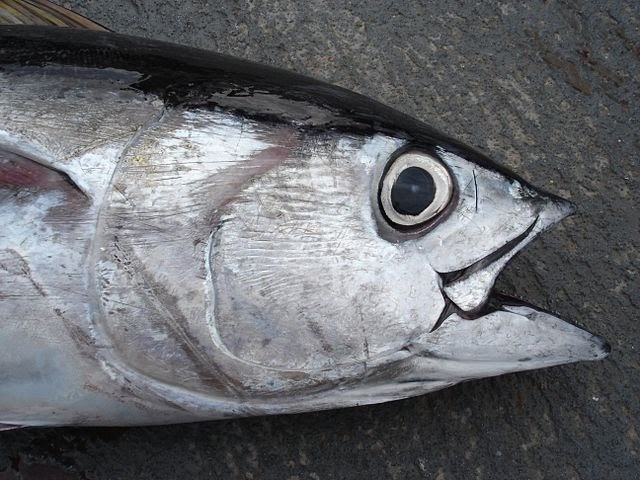 Bigeye tuna (Thunnus obesus) are another tuna species common in PIPA. They share some behavioral and life history characteristics with skipjack, but differ in important ways as well. Like skipjack, bigeye are highly migratory, traveling across international boundaries and are found in the temperate and tropical regions of all oceans (except for the Mediterranean Sea). Bigeye are also sequential batch spawners capable of spawning one batch of ripe eggs, and then as another "batch" of eggs matures, are able to spawn again a few days later. They also share the attraction to floating objects and often school beneath them, particularly as juveniles. Bigeye grow to be much larger than skipjack, and can reach lengths of six and a half feet (200 cm) or more and weights over 350 lbs (160 kg). They mature later (at around four years of age) and live longer (to approximately 12 years of age) than skipjack. They are quite similar in appearance to the bluefin tunas (Pacific, Northern and Southern), but do not grow as large. Bigeye also have remarkable diving abilities, and are capable of reaching depths greater than 1600 feet (500 m) while searching for food. At these depths, the ambient water temperature can be as much as 20° C lower than the surface temperature, and there is very little light penetration. Bigeye, aptly named for their relatively large eyes, have a tapetum lucidum, or light reflecting layer, behind the lens that helps them to see in low light conditions. Skipjack (and yellowfin tuna as well) can’t tolerate such extreme temperature gradients, and tend to remain closer to the surface to avoid depths that would expose them to water temperature differences greater than 8° C. This diving ability and eyes that are adapted to see at very low light levels, allow bigeye to exploit prey resources not available to other tuna species. Bigeye are under heavy fishing pressure in the western Pacific. A longline fishery for mature bigeye has been operating in the western Pacific for decades, and in 2011, the longline catch of adult bigeye was 67,700 metric tons—almost 150-MILLION pounds of fish. However, juvenile bigeye are caught incidentally in the purse seine fishery for skipjack as well, because the two species school together, particularly around FADs. In 2011, the incidental catch of juvenile bigeye tuna in the purse seine fishery for skipjack was 77,100 metric tons—that is 169,976,404 pounds and almost 10,000 metric tons more than the directed catch of adult bigeye in the longline fishery! The figure below shows the increase in purse seine catches of bigeye compared with other gear types since 1990. Though the international body that manages the tuna fisheries in the western Pacific, the Western and Central Pacific Fisheries Commission (WCPFC), has adopted restrictions on FAD use and closed areas to halt the overfishing of bigeye, those measures have proved insufficient to date. So what affect will the closure of PIPA to tuna fishing have on bigeye populations? At this point, it’s difficult to say, however, a recent study by John Sibert and colleagues  suggests reasons to be hopeful. Sibert’s study modeled a suite of different closure and effort control measures in the western and central Pacific management area using catch data from 1990 to 2003 (the time period during which the purse seine fishery and FAD use exploded). The idea was to determine what different closure and effort scenarios would have on bigeye population trends compared with what we already know occurred during this time period in the absence of these adjustments. Results indicated that closure of the high seas areas between 10° N and 10° S latitude and 170 ° E to 150° W to longline fishing would be beneficial to the bigeye population. This is because this region encompasses the western edge of a known spawning area for bigeye, so by protecting mature adults, more bigeye will be able to spawn and add recruits to the next generation. Since the 408,250 km2 of PIPA fall within the boundaries of this wider spawning area, one would expect to see an added benefit from increased protection of spawning size adults when PIPA becomes off limits to tuna longlining and other modes of capture. Williams P, Terawasi P. 2012. Overview of Tuna Fisheries in the Western and Central Pacific Ocean, Including Economic Conditions – 2011. WCPFC-SC8-2012/GN WP-1. WCPFC. Sibert J, Senina I, Lehodey P, Hampton J 2012. 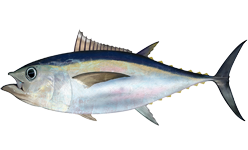 Shifting from marine reserves to maritime zoning for conservation of Pacific bigeye tuna (Thunnus obesus). PNAS. 109(44): 18221-18225.